hujev wrote: Another 'vote' for the Mirrycle...the bar-end version is even sturdier and less hassle to install. 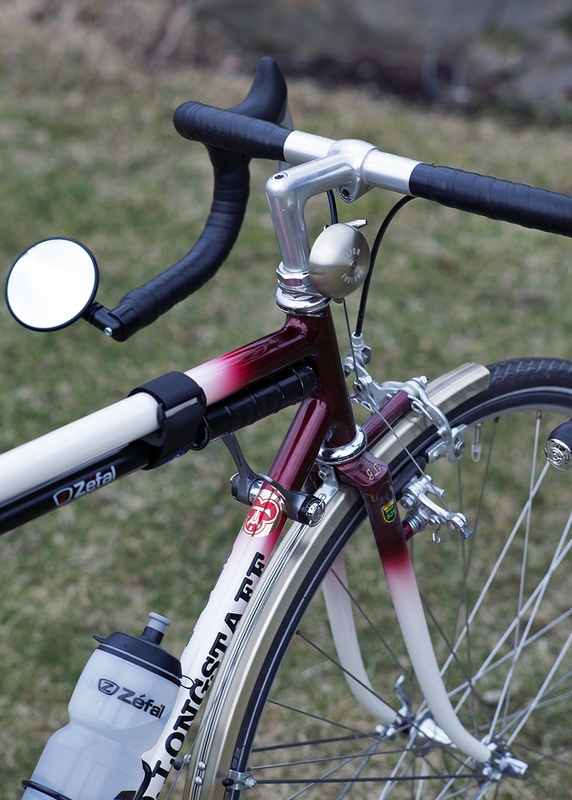 Of course it precludes use of bar-end shifters. Is that the one sold for flat bars? It works all right with drops? It comes with two end wedge bits to account for bars of different diameter - fits fine on 'normal' bars I've used it on. but I get the impression that others don't like it. Any reasons why? BTW I do have bar end shifters. P.S.1 - Interesting brake set up on the Longstaff ? P.S.2 - Those bikes are too clean. There's no such thing as a tailwind. It's either a headwind, or you're going well. The only thing that concerns me about most mirrors is if they'll break should the bike fall over on them,my first mirror was a Zefal one which was made of brittle plastic and just broke if I looked at it wrongly. The CatEye one I've been using passes that test,in fact quite a few time TBH it just folds up on impact and is made of a bendy polythene type plastic. Do the other mirrors on the thread pass this test(genuine question). I have a couple of spare CatEye ones you can have one if you like PM me if you're interested. reohn2 wrote: The only thing that concerns me about most mirrors is if they'll break should the bike fall over on them,my first mirror was a Zefal one which was made of brittle plastic and just broke if I looked at it wrongly. The B&M one is on a ball and socket fitting. The mirror just pops off and you pop it back on again. I've done it several times. reohn2 wrote: Do the other mirrors on the thread pass this test(genuine question). No, not really. The mirror I pictured above broke two or three times (and replaced) until I learnt not to let the bike fall over when loaded. I have one now that is taped up as well but no breakages for years. The good thing is that it velcroes off in seconds which means that it isn't vulnerable when the bike is put away. No-one would use a mirror by choice (faff and clutter) but some of us wouldn't cycle without one. I am not claiming mine to be the best but it mght be the best if you have bar end shifters. 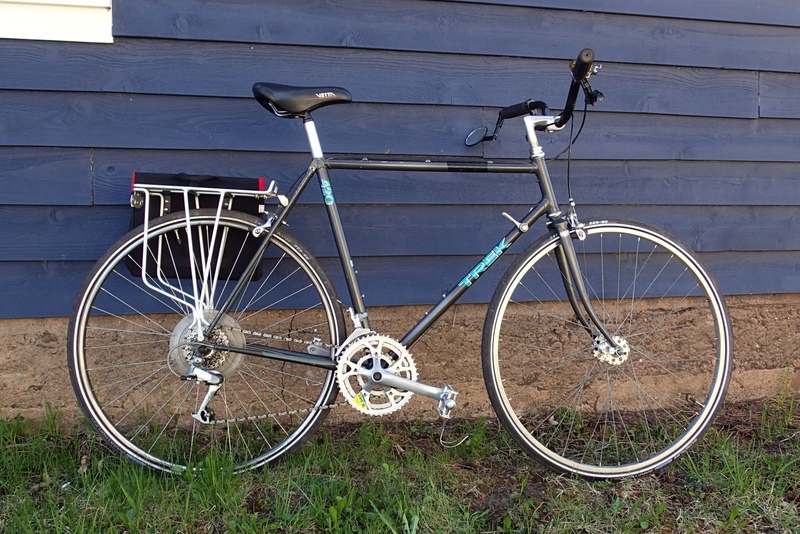 It was your photo that prompted my post,TBH from a personal POV I couldn't Live with anythinwrapped around the the hood(s),though you have a point about the bar end gearlevers. My bikes fall over from time to time. The mirrors never bothered much other than going off aim. Mercian's is quite well scratched on the plastic outer edge. Why are mirrors always black? Mick F wrote: My bikes fall over from time to time. Who'd buy a dayglow yellow one? Of course a tricycle can't fall over (unless you don't lean on a corner! ), but on bikes I usually fold them in when parking, just in case. Bike and trike in picture above clean as had just gotten the trike and completely disassembled, cleaned, polished (I like to car-polish bikes! ), etc., etc. before riding & photo'ing, and the Trek not as much but also had just been 'finally ridden' for first time (bought in 2013!). It fell off a post for a street sign.